Snowden at SXSW: It's time to let go of the whistle-blower. 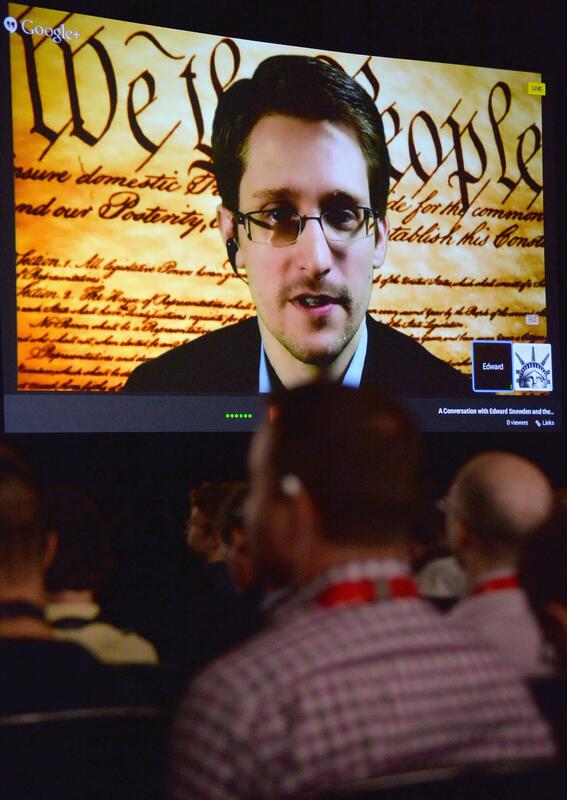 Edward Snowden speaks via videoconference SXSW. Edward Snowden lit up the audience on Monday this week at SXSW in Austin, Texas. Speaking via webcast from Russia, he covered everything from personal encryption tactics to the future of American democracy. The encrypted interview might have had terrible audio—but the content was excellent. Whatever policy and social reforms come out of his revelations will either revitalize or discourage America’s democratic progress. Meanwhile, back in Washington, the Senate Armed Services Committee convened a confirmation hearing on Tuesday to learn more about Vice Admiral Mike Rogers—President Obama’s nominee to head the NSA and Cyber Command. Of course, Snowden’s name came up, but not in a positive way. Tuesday’s SASC gathering made clear that Snowden remains a highly polarizing figure and—while he served as a messenger—he cannot make change happen on an institutional level. Why? Primarily because many dedicated public servants who work on policy dismiss his suggestions because they dislike his actions. In other words, many policy makers engage in reactive devaluation—a cognitive bias that occurs when a proposal is devalued if it appears to originate from an antagonist. And therein lies the dilemma for democracy: His actions have made obvious a set of issues that we must fix in order to remain true to our principles. However, what he symbolizes is vital and unacceptable at the same time. It’s time to let Snowden go and move on. Whatever course we take as a nation, our governing advice can’t come from him. At best, what he has illuminated will generate a civic dialogue that tackles important questions about democracy in the modern world. Can the United States set an example of how to keep a cool head while adapting to the communications revolution? Right now, it isn’t clear. Our activists and our institutions are divided. Since last June, the NSA and the related civilian leadership have been shamed and excoriated. But anger is not a productive organizing principle anymore. And yes, shaming has a role in the accountability system of politics—but it is not an emotionally intelligent strategy for winning the long game. If these emotions don’t evolve into creativity and genuine engagement, nothing will change. We need better public oversight that improves accountability and includes input from more people. Our existing governing oversight mechanisms offer a decent place to start. Optimizing for both privacy and security is a challenge facing corporations and governments. The policy process should be updated to include better fact verification and people with more technology competence. Intelligence gathering and other essential government functions have been overprivatized. Modern communications systems must be treated as critical infrastructure. Is it wise to have the NSA and cyber security under the same roof? If we want our civilian leaders and technologists to come together and craft well-considered policy, we need to get past the personality-driven talking points about traitors and heroes. It remains vital for those with technological knowledge to continue to lead this conversation on both the inside and the outside. Sen. Dianne Feinstein’s allegations that the CIA intruded into congressional computers is a huge opportunity to flip this whole conversation into an institutional framework, where problems require comprehensive solutions. If techies don’t let Snowden go, this won’t happen. The “on the record” discourse in the corridors of power will remain antagonistic, polarizing, and risky, and our nation won’t get to the important work of restoring robust civilian oversight of our national security apparatus.